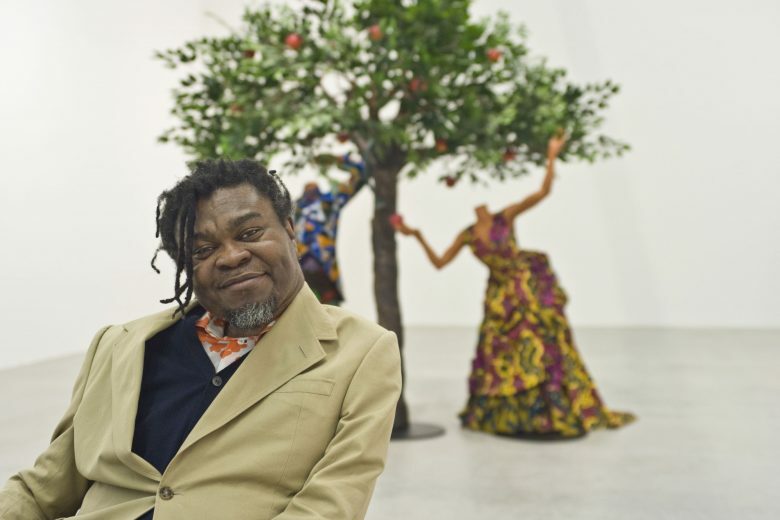 Yinka Shonibare CBE (RA) (b.1962 London, UK) moved to Lagos, Nigeria at the age of three. He returned to London to study Fine Art at Byam Shaw College of Art (now Central Saint Martins College of Art and Design) and then at Goldsmiths College, where he received his MFA, graduating as part of the ‘Young British Artists’ generation. Over the past decade, Shonibare has become well known for his exploration of colonialism and post-colonialism within the contemporary context of globalisation. Shonibare’s work explores these issues, alongside those of race and class, through the media of painting, sculpture, photography and, more recently, film and performance. Using this wide range of media, Shonibare examines in particular the construction of identity and tangled interrelationship between Africa and Europe and their respective economic and political histories. Shonibare discusses his process of marrying art and politics to critique post-colonial conditions and shares his passion for creating engaging works that prompt reflection on social and historical complexities. Mixing Western art history and literature, he asks what constitutes our collective contemporary identity today. Having described himself as a ‘post-colonial’ hybrid, Shonibare questions the meaning of cultural and national definitions. In 2019, Shonibare was awarded Commander of the 'Most Excellent Order of the British Empire' (CBE). In 2016, Shonibare was honoured for his contribution to African Arts and African Philanthropy at the Smithsonian Institution’s annual African Arts Awards. He also received a second award from the Museum of Arts and Design (MAD) for his visionary influence on the Arts. 2014 saw the artist’s work exhibited at the Gerisch Stiftung in Neumunster, Germany, and three of Shonibare’s Wind Sculptures have been displayed as part of the MCA Chicago Plaza Project. In 2013, the Yorkshire Sculpture Park mounted a survey exhibition of the artist’s work titled FABRIC-ATION, which then toured to the GL Strand in Copenhagen. In 2010, Nelson's Ship in a Bottle became his first public art commission for the Fourth Plinth in Trafalgar Square, London, which was later acquired by the Royal Museums Greenwich. 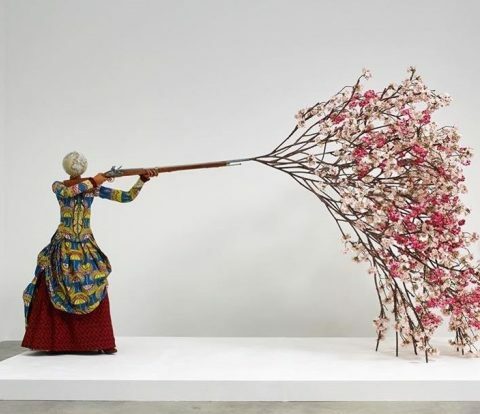 In September 2008, his major mid-career survey commenced at the MCA Sydney and toured to the Brooklyn Museum, New York in June 2009 and the Museum of African Art at the Smithsonian Institution, Washington D.C. in October 2009. 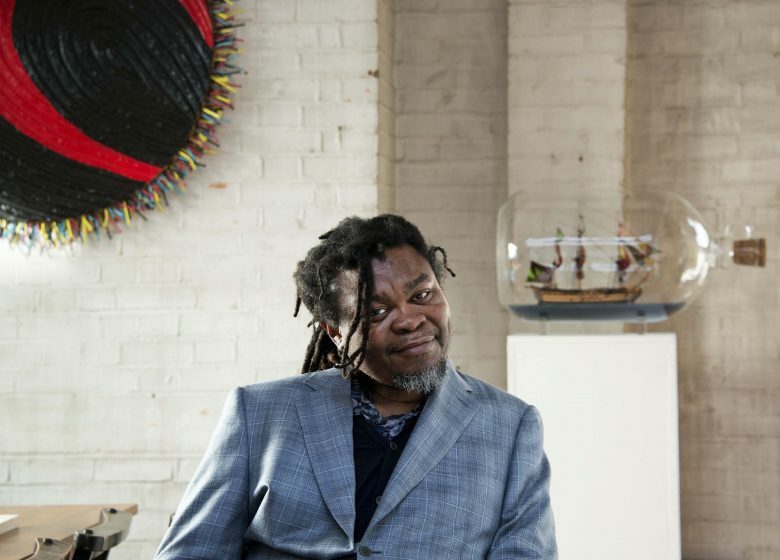 In 2004, Shonibare was awarded the decoration of Member of the 'Most Excellent Order of the British Empire' (MBE) and was a Turner prize nominee. In 2002, he was notably commissioned by Okwui Enwezor for Documenta 10 to create his most recognised work, Gallantry and Criminal Conversation, that launched him on the international stage. He has exhibited at the Venice Biennale and at leading museums worldwide. Recent solo exhibitions include: Enlightened Princesses: Caroline, Augusta, Charlotte, and the Shaping of the Modern World at the Yale Center for British Art, New Haven, Connecticut, US and Kensington Palace, London, UK (2017); Across Art and Fashion, Ferragamo Museum, Florence, IT (2017); Stephen Friedman Gallery, London, UK; Gemeentemusuem Helmond, NL; Smithsonian Institute, Washington, US and Memphis Brooks Museum of Art, Memphis, US (2016); Morris-Jumel Mansion, Washington, US; DHC/ART Foundation for Contemporary Art, Montreal, CA; Daegu Art Museum, Daegu, KR; James Cohan Gallery, New York, US and the William Morris Gallery, London, UK (2015). 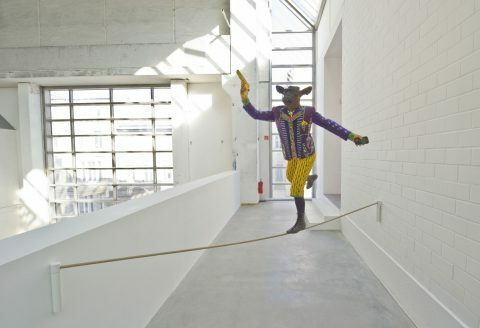 In recent years his work has featured in many group exhibitions including BODY/PLAY/POLITICS, Yokohama Museum of Art, Yokohama, JP; Animalia curated by Jens Hoffmann, Marian Goodman Gallery, London, UK; the Smithsonian National Museum of African Art, Washington, US; Turner Contemporary, UK; Lagos, NG and Blain|Southern Berlin, DE (2016); The Flag Art Foundation, New York, US (2015); Seoul Museum of Art, Seoul, KR; Ikon, London, UK; Hayward Gallery, London, UK; the Foundling Museum, London, UK; Royal Academy of the Arts, London, UK and Fondation Blachère, Apt, FR (2014).